The Kraftwerk project was started in 1970 by Ralf Hutter and Florian Schneider at their Kling Klang Studio in Dusseldorf, Germany. Within a few years Kraftwerk had achieved international recognition for their revolutionary electronic "sound paintings" and musical experimentation with tapes and synthesizers. With their visions of the future, Kraftwerk created the soundtrack for the digital age. Their compositions, using innovative looping techniques and computerized rhythms, have had a major international influence across an entire range of music genres. 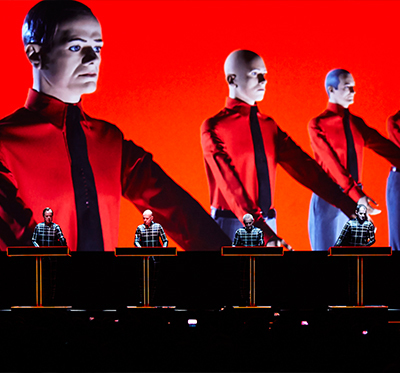 Their use of robotics and other technical innovations in live performance illustrates Kraftwerk’s belief in the respective contributions of both man and machine in creating art. The Kraftwerk live experience is a perfectly synchronised audio-visual spectacle complete with pristine digital sound and 3-D projections. It is a pure electronic art-rave. In 2012, Kraftwerk presented their Catalogue 12345678 for the first time ever at MOMA in New York City, and again in 2013 at London’s Tate Modern, the Opera House in Sydney and at the Akasaka Blitz in Tokyo. Festival appearances in the same summer of 2013 also left audiences deeply moved and impressed.